haihh. starting from this week till a few weeks after I'll be busy with tests, tests, and tests again. And oh ya, some assignments, replacement classes, portfolios and the list goes on. it's already the 6th week of the semester. that means there's 8 more weeks to go till final exam. there's still a lot of time. ::smiling:: well, here's a list of what I have to do this week and next week. tonight, I have runny nose, a headache, and a sore throat. I felt fatigued all over my body, and only wanted to sleep. suddenly, I was reminded of this infamous quote by a senior of mine. she meant that if you are sick and treat yourself like you're sick, i.e lying around doing nothing, sleeping 24 hours, being weak all the time, etc, then you are going to be really sick. but if you're sick but you act normally, you brace yourself to do normal stuff that you do when your not sick, then in no time, you'll be okay. 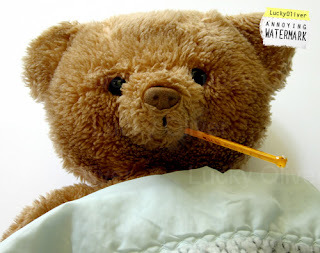 these saying has been used long among me and my friends in sggs so that we wouldn't be so weak each time we're sick. we took a flight to kl yesterday and dad drove us straight to kysm. it was their family day. so, as a family, we came. kysm is my brother's school and last night, there was this talent time. at first, me and my family did not plan to watch it because we were all tired with all the traveling. but JJ insisted us in watching at least a few performance so, we stayed. songs after songs being performed, we decided to stay till the end. 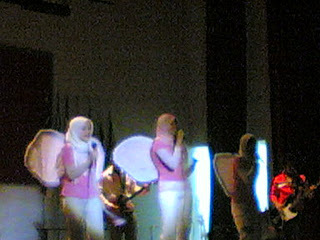 the performance started with solo performers followed by the group performers. 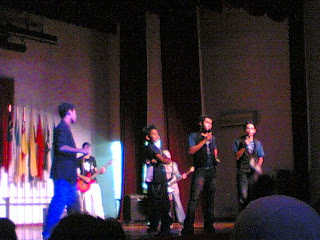 they had four emcee's and the four of them was really fun. they were bubbly and entertaining. they're great with words and know how to handle the stage when some technical errors happen. as for the singers, most of the singers can sing well. they got great courage to perform up there in front of a crowd of parents, families and schoolmates. there are some of these singers that I really like. one of the most entertaining performance is from the Biru group who sang 'Kenapa Singgah Kalau Tak Masuk'. they had great response from the audience as well as the judges hence winning the group category. their principal was cool too. she also contributed a song that night, as part of the special performance. she sung 'Fly Me Too The Moon' which was quite a famous song. her voice was okay too. 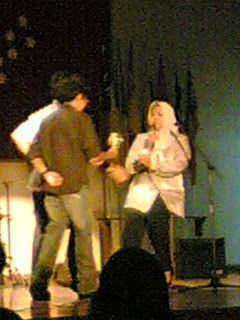 she also managed to get some flowers from her male students ::=P:: Overall, the talent time was a blast! p/s: sorry for the blur pictures. Mei looked at the kancil's driver. p/s: Happy 51st Birthday Malaysia! Merdeka! hey there! just a short announcement. today, I got MY CAR! ::smilling:: can you believe it? at last. Dad came just now and gave me my car. thanks a lot Dad! life will be much easier with it. I was back from recmo's pre-event yesterday. here's my story. we started our journey by gathering at v2 cafe. we were supposed to depart at 1500 but we end up departing a bit late. while in the bus, most of us were sleeping maybe because we were all tired. after a few while, the bus stopped at RNR Bukit Gantang. we ate a little bit and continued our journey to SM Teknik Taiping. as soon as we arrived there, we were shown where we are supposed to live for these two days. then, we ate our dinner. the opening ceremony started a bit late that night but everything went almost smoothly. why almost? because the pnp's brought the wrong video (which is the low quality one) and the other video was corrupted. other than that, everything was as planned. after the opening, we we're divided into groups. I was given the responsibility to facilitate the A8 group together with Amirul. 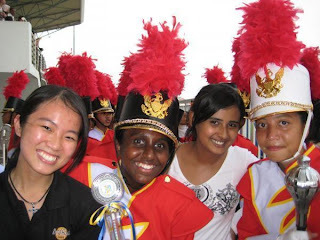 what's interesting was Amirul and I were both from Penang as well as other two members of our groups! the next day, we run modules and games with our respective groups. I had to leave the group earlier after our lunch because the pnp's need to make a montage for the closing ceremony. even though there was not enough time, we manage to complete it. credits to Cipul and Watip too! everything went well after that. the event was done in a very short time. however, strong relationships was build between us, the utpians and the students. it's also nice when we manage to cooperate and do deliver our tasks successfully. thanks, RECMO family! I've just came back from independence week 51 (iw51) opening ceremony. the event was okay. a bit disastrous though. but okay. why disastrous? hmm. maybe because the majority of the audience is us. the comities. actually we have made it compulsory for the foundations to come. but they suddenly have a talk with Dr. Balbir. so, there goes the audience. the performance was good too. but its nothing like when I was in sggs. there was this silat performance, some poetry recitation and the utp orchestra. utpo's performance is the only interesting performance actually. in sgss, you get more than this. we have cultural dances from at least 3 different ethnics, a great theater performance and sometimes musical too, directed by ourselves. we also have poetry recitation but with more passion. much better than what I heard in mph just now. and of course the ever great performance from our band. when utpo performed just now, something somewhat struck me and suddenly brought me back to my school days. utpo were playing some few beautiful songs. but my eyes keep seeing the white pants with red stripe. 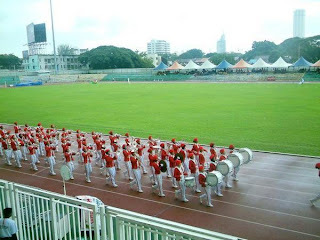 I saw some passionate drum majors like kakNyak, kakShida, kakAzreen and the whole band crew playing zealously. dancing and playing and making brilliant music. oh how I miss my school days! the band would perform in almost every event. 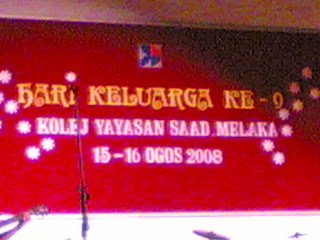 they will play the negaraku and lagu negeri pulau pinang as well as our school song during special assemblies. 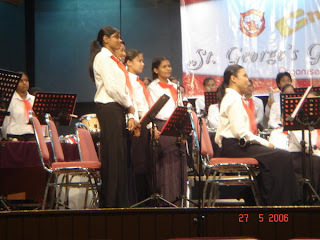 I remembered singing "St. George's! St. George's! we'll ever proclaim. honour and uphold you forever praise your name" with my friends with all our hearts. 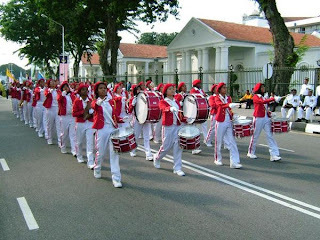 during auspicious events like sports day, MSSM, hari anugerah cemerlang etc, the band always accompany us, the police cadets with their superb drum beat. they also have concerts and wind orchestras with tickets usually sold out. I remember how the would play on stage. they didn't only play, they dance too! and the crowd will go crazy with all the screaming and cheering. Mr. Haswani Hassan should be credited for creating such a magnificent band that always made the school proud. Good luck SGGS band! 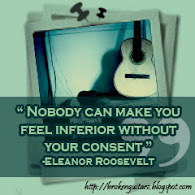 We Must, We Can, We Will Improve The Band! efinally i'm able to update my blog. these past two weeks have been very busy for me. I don't even have time for myself. the first few days, i've been busy with adding and dropping my courses and arranging my timetable. this semester i have registered for 6 courses and 1 co-curiculum. in the second week of semester, UTP held an event called MMK which stands for Minggu Mesra Kampus. this event is to promote students to join clubs and events that will be held during this semester. my weekend was filled with decorating mounting board for RECMO's booth for the MMK. my housemate Waniii have give her upmost cooperation for this event as she is one of the committee. congrats for her and all other committee as the even was a success. I also did some photo shoot for RECMO's tag. redesigning of RECMO's t-shirt and some other stuff. Most of my time is filled with meetings. it was Mimi's birthday last week. so, I had some fun times in Ipoh. it was also Dayang Farhana (my housemate) and Jayzee's birthday. so that's it I guess. I need to start studying. I have OOP test next week. and if I failed, the lecturer will force us to drop the course. ::haih:: I will go to SMK Teknik Taiping next Friday for RECMO's pre event. Yeay!